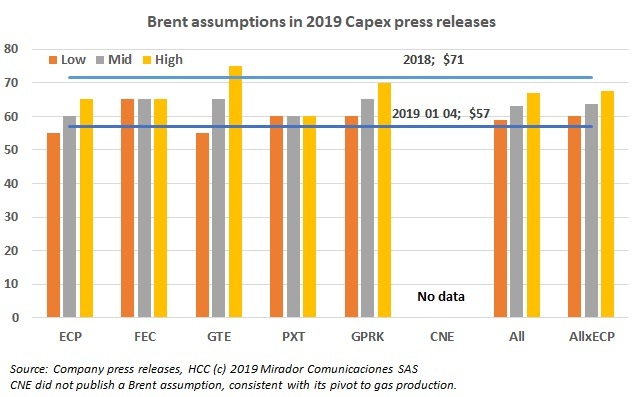 Where does Capex go with Brent so low? 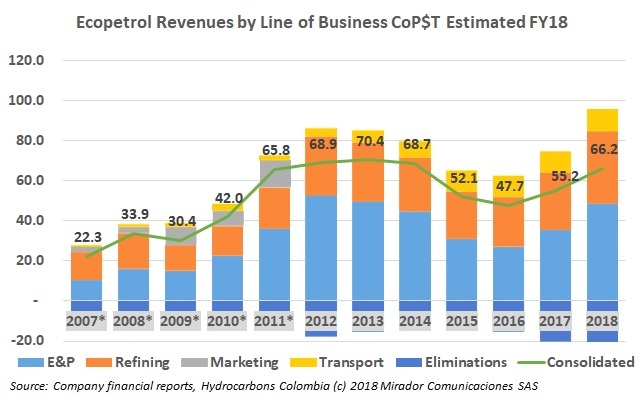 Colombia-focused oil companies dutifully did their 2019 planning, a meticulous process requiring formal Board approval, which can take many months to complete. But at the beginning of October, Brent started to slide nearly 37%, from US$84.16 on October 5th to US$53.21 on December 28th, although it was up considerably last week (Jan 4th) to US$57.06. The Constitutional Court has been active lately, addressing a number of important issues like the apparent legal conflict between the central government’s ownership of the subsoil resources and local communities’ rights to determine what happens on the surface. We were talking with Hernán Rodríguez, Partner at Dentons, Cárdenas and Cárdenas about the conundrum and he offered this discussion of so-called ‘Cumaral ruling’ which resolves some issues but introduces others. 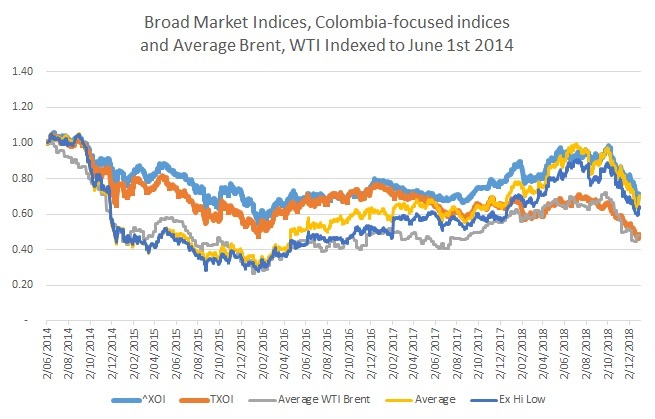 Like most everyone else in the industry, Ecopetrol (NYSE:EC) is having a great year financially and statistically. However, the integrated nature of the the NOC means it takes a bit of work to see what is happening in just the E&P business. Dear A: Thanks for the Don Julio Reposado the other night in your apartment. It was the perfect antidote to a damp and cold Bogotá night. I looked up the El Tiempo anti-fracking article that had disturbed you so much and it was full of so many half-truths and complete falsehoods, that I wrote this letter to clarify it for you. 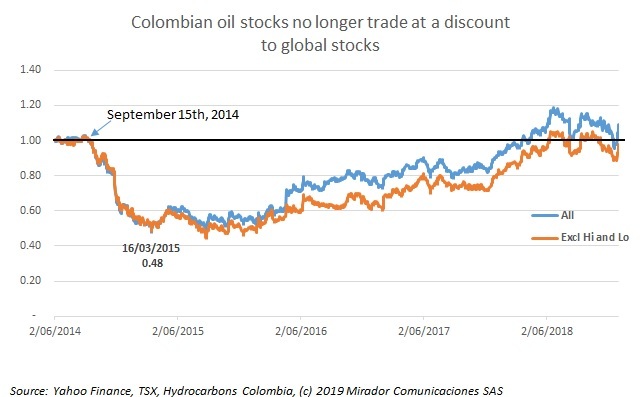 At the Oil and Gas Summit, both MinMinas Maria Fernanda Suárez and ANH head Luis Miguel Morelli promised a competitiveness study to see where Colombia had to improve its regulation. 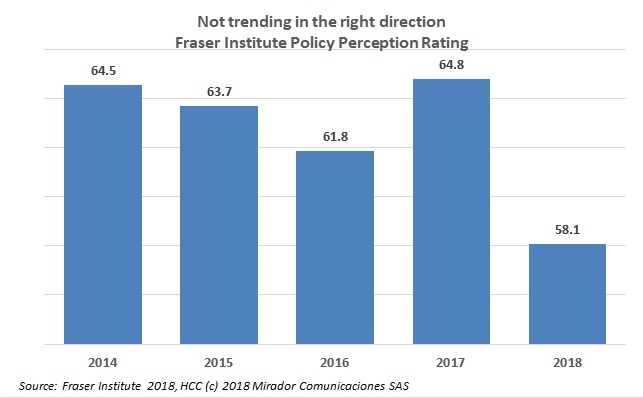 The well-respected Canadian extractive-industry think-tank, the Fraser Institute (FI) has either done that for them or given them a place to start. The ‘100-days’ stories were a week or two ago and I had planned to write a ‘Duque-year-end-in-review’ article on December 17th, my last ‘long-form’ article of the year. But well-respected think-tank Inter-American Dialogue published this report last Friday and I thought I should take advantage of the multiple points of view.